In the first few years after I returned to the U.S., I took my sister-in-law to the "Daiso Japan" shops in the Bay Area. The Daiso is a hundred yen (dollar) store in Japan and other parts of Asia, but most things are a $1.50 in the U.S. When my sister-in-law remarked on Facebook that it was so cheap and had a lot of interesting items, someone who had lived in Japan for a long time scoffed and remarked that those things where 50% less in Japan. The implication was that that was no deal. My feeling about this response was, "Are you new?" This person had lived in Japan for longer than me and should have known better. You can't compare prices in one country in which a product is originally distributed to those in a country that they're exported to. We believed we were very lucky if we could get goods from the U.S. at Costco Japan or the Foreign Buyer's Club for a mere 50% mark-up. If it was less than that, it was a rare and enormously special deal. Usually, we were just glad that something from home was available at all. 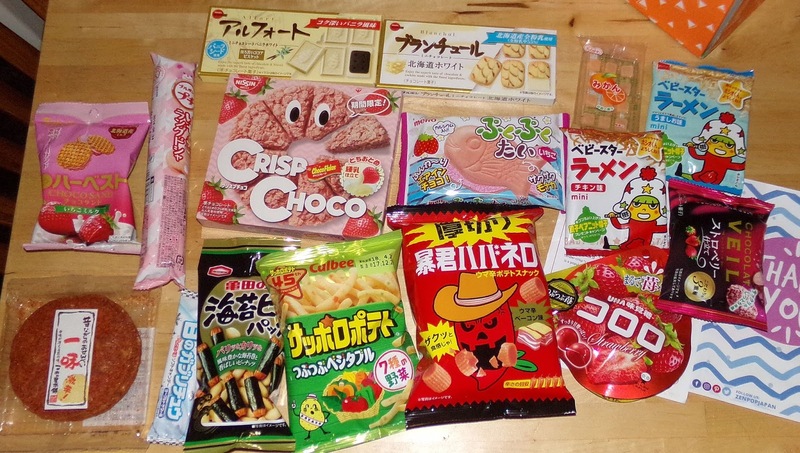 If you are looking for Japanese snacks, the main thing you want is to get things that you can't get locally, and, yes, there will be a mark-up to pay the people who do this business for their time. 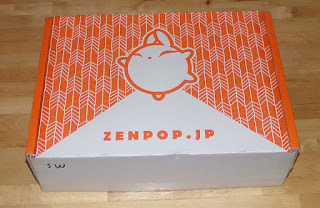 This is my second unboxing of a ZenPop box. In my first, I focussed on the service itself and it's value in a very granular way. You can see that overview here. 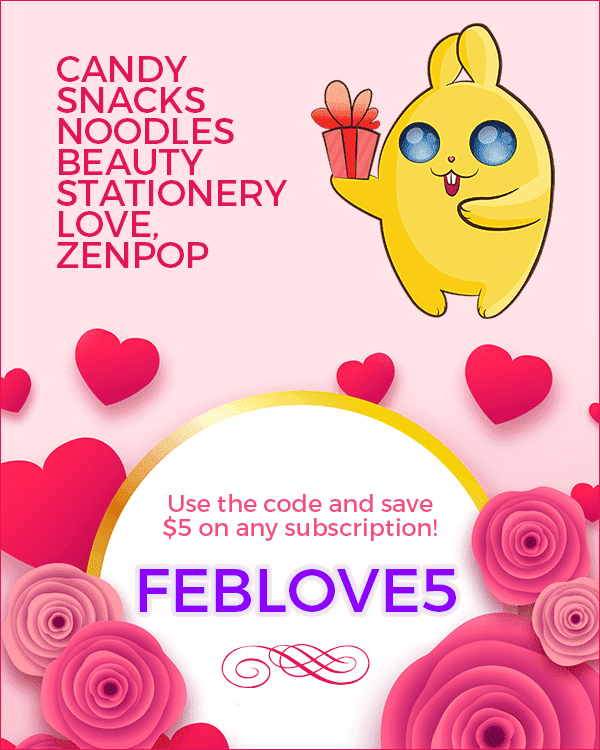 The bottom line is that I think their contents represent one of the best values in subscription boxes that you can get at present and that the mark-up on items to pay for their efforts is likely between 40-50% (I'm not including shipping and packaging costs in that estimate). It's not nearly as cheap as if you lived in Japan and could buy these things for yourself, but, if you need someone to go to the trouble of shopping, assembling, packing, and mailing it to you, you can't really do better. Click these smaller images to load a bigger one that you can read. Since I already did a lengthy post about the service, I see no reason to repeat that here and am going to just focus on the contents. 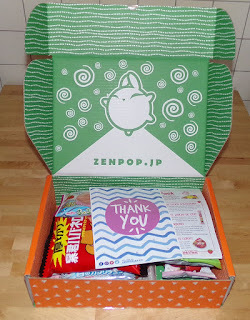 The box is called the "kouhaku" (red and white) box because the snacks follow a theme in terms of the colors of the items. This is quite appropriate for this time of year in Japan because it's nearly Valentine's Day and winter and spring are popular times for strawberry-flavored snacks to make their appearance. 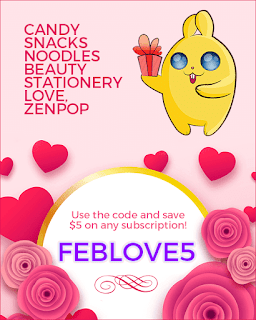 It'll also straddle the companion holiday for Valentine's Day in Japan ("White Day") which comes in March. Keep in mind that you don't need me to explain these things. There is a color page with explanations in the box, but I can at least add some context and my own subjective feelings about these products in thumbnail format. I will be reviewing some of these items on their own in future posts. Tyrant Habanero Savory Bacon Flavor - I'm a huge fan of the "Tyrant Habanero" line of products because of their strong heat and savory notes. This one is, oddly, not listed on the Tohato web site at present, but that makes it no less welcome. You can always tell this product line because of the evil hot-pepper-o-lantern on the bag. The five peppers reveal that this is one of the hotter products in their line-up. I've reviewed these items no small number of times in the past. Ichimi Sembei - I am a sucker for the old-fashioned enormous rice crackers that you can get as souvenirs in Japan. I'll admit that even though this isn't as flashy or as approachable to Western palates as the rest of the box, this is the thing I was happiest to see included. This has togarashi, a spicy capsicum which is often ground and placed on tables in Japanese restaurants which offer dishes that can benefit from their addition. It's similar to the way red pepper flakes show up in Italian restaurants or pizza places in the U.S. 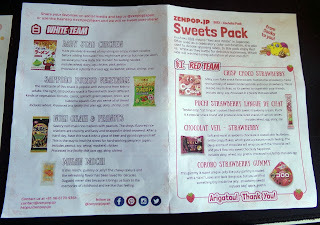 Harvest Choco Sand Strawberry Milk - In the last box that I received from ZenPop, I got the mont blanc flavor of this snack and was disappointed because there was a coconut back-drop that dominated. I'm hoping these will be better, but I'm pessimisstic. The Harvest biscuit line always has a strong coconut flavor and I can only hope that it pairs better with strawberry filling than the fake-tasting mont blanc of the previous offering. Nissin Crisp Choco Strawberry - I know Nissin mainly for it's savory meal offers including instant noodles. I used to see these snacks, which I regard as sort of a "Choco Flake" pie/pizza, but never bought one due to the larger footprint. I always liked "Choco Flake", which is chocolate-covered cornflakes, so I'm looking forward to trying this. Bourbon Petit Strawberry Langues de Chat - Langues de Chat are like a Milano cookie on a diet - thing, crispy, delicate cookies with a candy-like choclate filling. Bourbon's version in these long tube-like packages is a baby version of the slimmed down Milano. Meito Puku Puku Tai Strawberry - This is one of a handful of kid's snacks in the box. "Puku puku" means bubbling or puffy (among other things) and refers to the foamy, whipped center of the cake-cone-style "fish's" filling. The outer shell, a monaka, is generally pretty tasteless and mainly lends texture. I'm expecting this to be more of a textural delight than a flavor one. Chances are the filling will be pretty sweet and the shell quite bland so it should be interesting to try. Chocolate Veil Strawberry - These are a new product to me in terms of the brand name, and it looks very interesting in terms of the construction. The outside looks like a thing, crispy shell and has a softer, whipped-looking filling. I don't know if this is new or if it's just that I haven't lived in Japan for six years now, but I am looking forward to something different. Cororo Strawberry Gummy - The picture of these on the package is odd. They look really round and slightly puckered and bring to mind umeboshi. 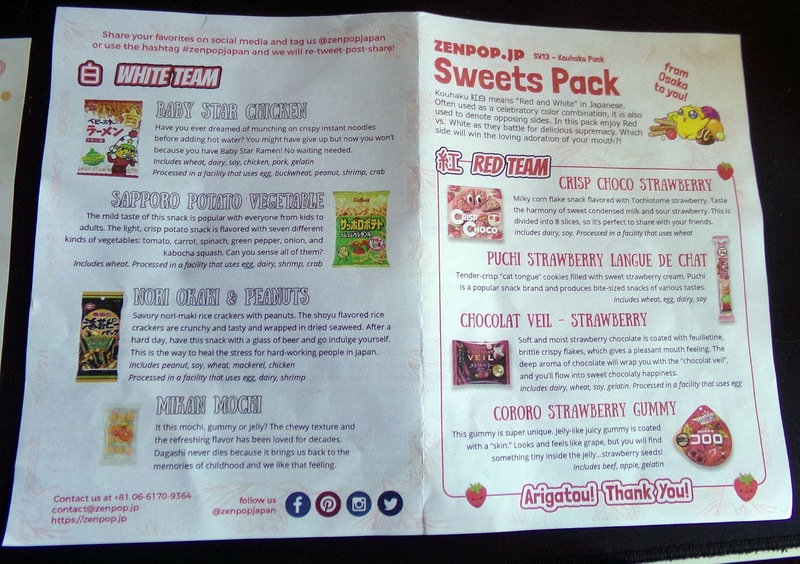 The description in ZenPop's flyer says they are like grapes. This would be something new as I don't recall ever seeing this type of gummy when I lived in Japan before. Alfort Vanilla White candy/cookies - Alfort occupies an interesting space in the Japanese snack world. It looks like a candy on the front with a solid slab of chocolate and a cookie on the back with a full tiny biscuit perfectly embedded in it. In the past, I reviewed the green tea version and really liked them. I've already sampled these and they are like cookies and cream in the overall flavor profile. The white chocolate is much better balanced than most as it is not cloyingly sweet. They are delicious. It's too bad that the Alfort brand isn't available in the U.S. as it's a more elegant sort of candy and is in individual pieces for good portion control. Blanchul Hokkaido Milk cookies - These look like langue de chat by another name to me. I reviewed a mont blanc (chestnut) version of these previously and loved them. Baby Star Shio (Salt) and Baby Star Chicken (2 separate packets) - I have to admit that these are the two things I'm the least interested in. 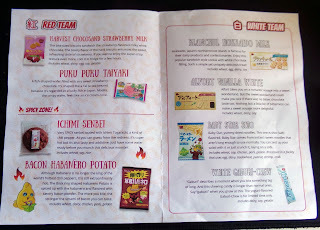 Though I have reviewed Baby Star ramen snacks before, and at least liked them a bit, I have to say that I've never felt that I was eatier junkier junk food than when I tried ramen salted snacks. They tend toward being very salty, crunchy, and carby in a way that makes me feel even guiltier than if I were eating corn or potato snacks. Yogurt-flavored White Caburi-Chew - This one is completely new to me in that I not only have never tried this brand, but I've never seen it. We'll see if I get to keep my fillings. I am happy for a yogurt-flavored item in the mix though. It's a flavor that is less commonly represented in snack boxes. Sapporo Potato Vegetable - Though I wasn't disappointed to find this included, it's also one of the easiest imports that you can locate in Asian and import markets. Also, my previous experience with a "pebbly" (tsubu tsubu) variety was not encouraging so I'll have to see if this is better. Nori Okaki & Peanuts - Along with the big, spicy sembei cracker, this was something else I was delighted to have included. It's produced by my favorite rice cracker manufacturer in Japan - and, yes, I know it's weird to have a favorite sembei brand - so I have high expectations. And, the wild card is: Mikan Mochi. It's included in the "White" section because mochi is usually white, but these are tiny little orange blobs that you poke with a toothpick to pick up and eat. This is also a new item to me (and a kid's snack) so it should be interesting. I'll be reviewing as much of these items as I can, though I do have a tendency to eat them up faster than I can write reviews. I have to say that I'm pleased with the overall mix of salty and sweet as well as the textural variations and the "modern" (e.g., chocolates and cookies) and the "traditional" (e.g., sembei). Though I can't say this would be the mix I'd perfectly pick if I was buying for my tastes and mine alone, I think it's a good sampler pack for someone who isn't me (and I'm not narcissistic enough to think everything should revolve around my tastes. Cororo are kind of weird--tasty, but texturally odd. "Like grapes" is a good place to start. I look forward to your reviews of all this tasty goodness! Hi, Hiroyuki, and thank you for commenting! I didn't check out Snakku before, but I did after you mentioned it. I'm glad for the focus on more traditional snacks, but I wonder about the value for the contents. The tasting box looks pretty puny and the quantities for the other box (which is nearly $40) are not clear. It looks a lot like what I got annoyed with with another box which is that they buy a multi-pack of something and then break it up to give bits and pieces to people. For example, they get a big bag of individually wrapped sembei nad give 2-3 per box so it's costing them about 20-60 yen only for that contribution. I prefer that the products aren't broken up multi-packs for a number of reasons, not the least of which is that you don't get manufacturer and product information (or ingredients). You mentioned that you have never gotten anything that you can buy in a big-name grocery store, but one of the photos on their site shows Pejoy and Glico caramels (both are pretty common). Is the picture misleading? How do you feel about the value you get for Snakku? It does look nicely wrapped, but I'd probably go for Bokksu for traditional snacks if I wanted to pay more (especially since they now offer lifetime discounts per box with certain codes). How do you think Snakku compares to Bokksu (which I've reviewed before)? I've been subscribed to Snakku for two years this April. I believe one month we got a box of specialty Pocky, the superthin variety or something like that, but not the standard red box (and never Pejoy). And I hadn't gotten Glico caramels until today, in the Valentine's Day box! You jinxed it! ;) But I can't get those without going to a specialty Japanese store here, so I don't mind as long as they don't make it a habit. On the other hand, they (like you!) often introduce me to some great Japan-only products, like the Sugar Butter Sand Tree cookies I picked up on my very next visit to Japan. It's true that breaking up the multipacks has its downsides. I remember an individually wrapped bite of baumkuchen that was unfortunately packaged in a slightly porous wrapper, which only works when it remains in a bigger outer bag that's clipped closed. The cake was stale and inedible. They do provide a sheet with product information and a brief ingredient listing, which is handy for folks with allergies but not enough for people like me who'd prefer to be able to keep an eye on their calories. I might pick up a Bokksu if they have an attractive theme one month, and maybe you'd like to do the same with Snakku sometime, if only to judge the packaging and all that. Pick one you like and take it from there. Thanks so much for the detailed reply! I really, really appreciate it and will consider it, though it sounds a bit iffy in terms of quality and quantity. Bokksu does also have themes each time. They let you know the theme first unless you're a subscriber and automatically get it. 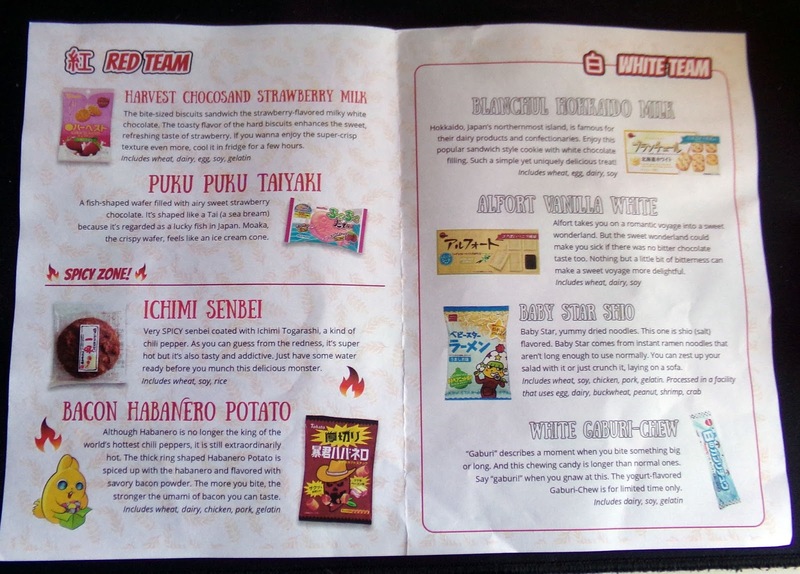 They "curate" the boxes by pairing the food choices to the tea choice. I liked that element. If I were in your shoes, given the high price of the boxes, I'd be pretty unhappy about the stale baumkuchen and would have requested a fresh replacement. I hadn't thought about how breaking up the packs would create a situation where things would go stale, but it definitely makes sense. I think I had that experience while living in Japan and buying something and failing to re-seal the bigger bag. Thanks again. I love this sort of information! And, thank you for reading!